"Travel is the only thing you buy that makes you richer." Those words ring even more true thanks to our new AzAmazing Sale! These select cruises come with a $500 onboard credit, and are combinable with our promotion to receive 50% off your companion's cruise fare. Wow! That's even on top of what's already included during an Azamara cruise. This cruise begins in exciting Hong Kong, and includes overnight stays in Halong Bay (Hanoi), Da Nang (Hue and Hoi An), Ho Chi Minh City and Klong Toey (Bangkok). That's plenty of time to explore everything from ancient temples to modern, bustling cities. Many of our Azamara crew members say the most memorable place they've ever been (and they've been everywhere) is Antarctica. Why? Because there's nowhere else like it. It's pristine and majestic, with nearly 24-hour sunlight, massive icebergs and, of course, penguins! Our previous cruises to Myanmar (Burma) have been so popular that we're back for more! This itinerary begins in Singapore, and includes three days in Burma and two in Phuket, Thailand. You can visit with orangutans at a sanctuary on Sumatra, and shop til you drop in Kuala Lumpur. Thanks to the World Cup, traveling to Brazil is on everyone's bucket list right now. And no wonder! This itinerary is the perfect mix of vibrant cities, quiet colonial towns and swanky beach resorts. Food, art, culture, wine - South America has it all. Lush jungles, relaxing beaches and renowned temples - this itinerary is a travel dream come true. 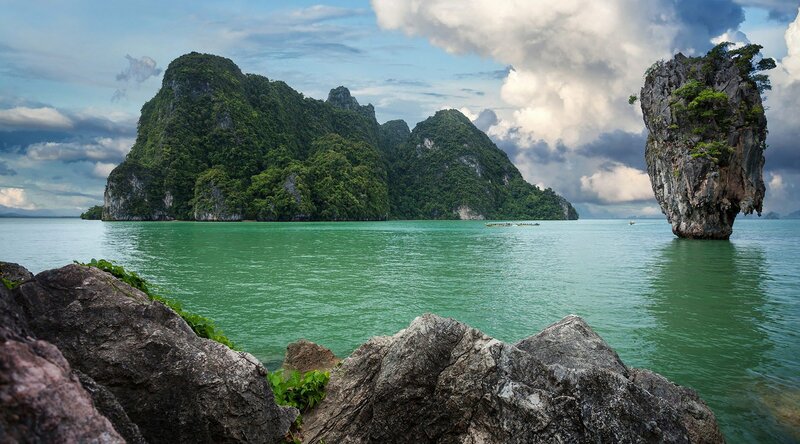 In Ko Samui, Thailand, you can relax on the beach or go on an exciting elephant trek. Three days in Bangkok gives you plenty of time to tour, including a visit to spectacular Khmer temples including the famed Angkor Wat. Semarang, Indonesia boasts not one, but two UNESCO World Heritage Sites: Borobudur Temple Compounds and Prambanan, considered by many to be the world’s most beautiful Hindu temple. And, of course, don't forget to set some time aside for lounging on the beach in Lombok. There's visiting Rio...and then there's visiting Rio during Carnival. It's the greatest party on earth! This itinerary offers the perfect mix of excitement (Rio), relaxation (the beach towns of Buzios and Punta del Este) and culture (two full days in Buenos Aires). This itinerary features eight different ports, each with its own distinct experiences. Take in art and temples in Bali and come face to face with Komodo Dragons and orangutans in Indonesia. In Taiwan, you don't want to miss the Taroko Gorge, a stunning marble canyon of waterfalls that will take your breath away. Two overnights in Osaka gives you time to visit the beautiful, nearby cities of Kyoto and Nara, or dine on famed Kobe beef in Osaka's fantastic restaurants. A perfect cruise for city-lovers, this voyage features overnight stays in Osaka, Shanghai, Hong Kong, Ho Chi Minh City and Singapore. Take in the night markets of Hong Kong, eat street food in Singapore, and treat yourself in Shanghai's famous shopping districts. This cruise also includes six sea days, so you'll have plenty of time to relax and recuperate along the way. Who says you have to choose between immersive cultural experiences and pampered days at sea? This itienrary gives you both! During your days in port, you can visit UNESCO World Heritage Sites, temples, rain forests, an elephant orphanage, beaches, markets and more. Enjoy the gran colonial architecture and Bollywood energy in Mumbai, and then move on to the opulent destinations of Muscat, Oman and Dubau, UAE. Ready for an adventure? You'll begin by exploring the epic national parks of Costa Rica. After voyaging through the Panama Canal, get ready for great food and even better music during an overnight stay in New Orleans. This voyage concludes in Miami, but not before you spend a relaxing afternoon in Key West. There's something special about Transatlantic voyages. Twelve sea days leave plenty of time for relaxing - and plenty of time to use your free $500 onboard credit. Dine in specialty restaurants, enjoy a massage or spa treatments, shop at our onboard boutiques - the options are endless. This voyage begins with overnight stays in the dazzling cities of Dubai and Muscat. Enjoy the country-club-style onboard experience during a week at sea before passing through the Suez Canal. Our outstanding crew know how to pamper our guests and make you feel at home. Explore the Holy Lands, including overnight stays in Haifa, Israel and Istanbul, Turkey. With these fantastic twelve voyages, your only problem will be choosing which one to join us on! The AzAmazing Sale is on for a limited time, so don't miss out!